More info:520 Euro per person - price when two travellers on a Double Occupancy Bed and breakfast basis. 820 Euro - price for a single traveller on a bed and breakfast basis. Some taxi rides r included, but no transport from Troodos to Akamas, or to airport. Spend a week in Cyprus, walking its varied landscape and following trails no car can reach, on this self-guided trip. There are six short walks to enjoy, with bus and taxi transfers to the start and end of each route. This is a great overview of Cyprus, from the unique geology of the Troodos mountains to the beautiful and rugged Akamas promontory. Walk along rugged coastlines to tranquil bays, through pine and cedar forests, along mountain trails and vineyard paths. 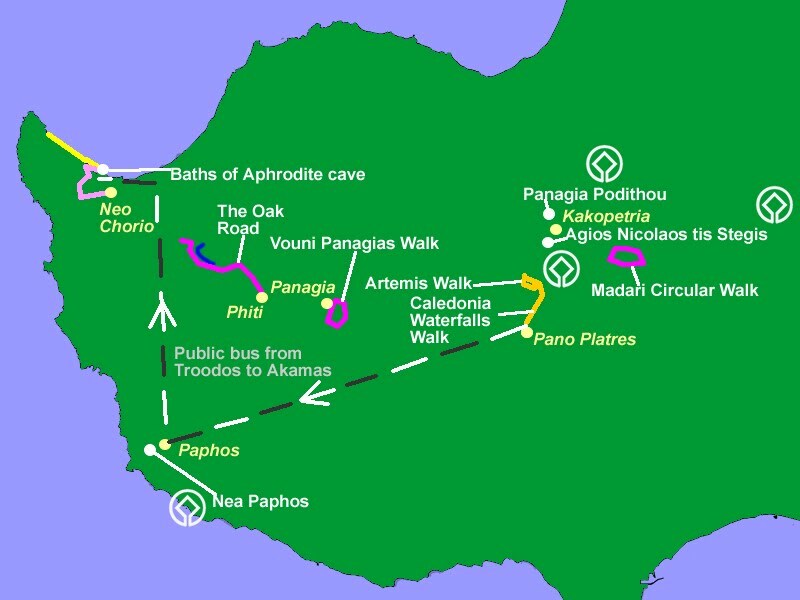 Enjoy two days of walking in the Troodos mountains, the largest mountain range in Cyprus, two days in the Akamas promontory, with stunning views of the coast and two days in the Paphos region, walking the Vouni Panagias walk and the Oak Trail, from Phiti village to Evretou Valley. The suggested mix of walks, each with an average distance of 12km, is only for guidance. Some of the walks can be shortened and others replaced (we can provide alternative information) without changing overnight locations or costs. The short Akamas panorama walk can be replaced with shorter walks, such as the Adonis nature trail. The north Akamas coast walk can be shortened considerably as it is linear, so you simply return on the same route. Walk through a variety of habitats, swim in the pristine waters of Akamas, where Aphrodite, the Greek goddess of love and beauty was thought to have lived. Keep an eye out for rare Cyprus mouflon and if here from May to October, look out for green and loggerhead turtles on the north Akamas coast. There are cultural attractions to complement the natural diversity, including the Troodos Painted Churches and the ancient Roman structures of Nea Paphos, all UNESCO World Heritage Sites. You might also like to visit a local winery. The trip is based on one couple sharing a room on a B&B basis, with a single supplement for solo travellers, staying in Kakopetria, Paphos and near Akamas. Wildlife: One of our projects to protect the environment is in the form of a reforestation experiment in Xeros Potamos Valley on private land (7 hectares). The experiment has a long history (it started in the late 90s), but the main actions took places in 2006 when we planted 3,000 saplings mostly of wild olives as well as of hawthorn (also some oaks, pines and cypresses), two plants that are found in the area and are suitable for dry climatic conditions. 1,000 trees survived only to perish through a wildfire in 2013. The vast majority of the young trees grew new shoots in the years after the fire, so we are confident that the experiment is successful. We envision developing the experiment into an environmentally friendly agrotouristic refuge, where travellers would be able to engage in agricultural work with regards to olives, hawthorn, vine and herbs cultivation, have a base for exploration of the beautiful area of Xeros Potamos Valley and a refuge inside nature away from busy cities or resorts. Where possible, we design our travel packages with the intention of enriching our clients experience by taking them through places where it is possible (but never certain) that they will spot very local wildlife. Travellers have the possibility to spot moufflon (a shy, local wild sheep subspecies that resides in Paphos Forest but also wanders further east, near Marathasa Valley, where the village of Pedoulas is and even all the way to Olympus peak). Travellers may also have the possibility to spot green or loggerhead turtles, many of which visit the north Akamas coast to feed in the warm season (about 2,000 individuals lay eggs in summer on the island) - and we always provide instructions on the best and most responsible ways to view any wildlife we encounter. Transportation: We aim to minimise as much as possible the use of transportation on our trip because this would be in the interest of the environment in general and of our clients in particular since this is reflected in a lowering in the price of the package. We encourage our clients to use local public transportation as much as possible and we use local taxi when public transportation is not efficient or non-existent. We use a local taxi to transport our clients from the airports because there is no efficient public transportation to Kakopetria village (from Larnaca or from Paphos airport customers would need otherwise to use three public buses to reach Kakopetria). We include no transportation from Troodos mountains to Paphos, from Paphost to our clients’ accommodation near Akamas and from the last hotel to an airport because we consider public buses to be of an adequate quality for the specific purpose. We encourage our clients to visit a number of local attractions (many of the six Unesco World Heritage Troodos painted churches) on foot. In the specific package we do not include dinner even though it would probably be a bit cheaper for the traveller. We prefer to encourage travellers to explore the local communities and benefit a larger number of locals by spreading their spending. This interaction and financial benefit gives an incentive to the wider community to conserve their heritage. When we use taxis (especially long distance) we make a best effort to use locals instead of professionals living in the cities because we like to support the local, rural economy. Our services are about authentic experiences, and cultural heritage is one large element of these. Local cuisine is a living component of our cultural heritage, reflecting the intermixing of a number of civilisations that came to the island. We encourage visitors to try the local cuisine (including halloumi, the Cyprus cheese), because we consider it of high quality. We encourage travellers to visit at least one rural winery (on their free day) since the island has a long wine history and indigenous grape varieties not found anywhere else (like Xynisteri, Maratheftiko and Spourtiko). Such visits in turn benefit the wine makers and provide them an incentive to continue to cultivate the ancient vineyards and produce quality wine. We encourage travellers to visit many of the Unesco World Heritage sites on the route (six of the ten Troodos painted churches and Nea Paphos – mosaics and Tombs of the Kings), and possibly other attractions on the itinerary, watermills, a medieval bridge, picturesque villages and even ancient trees, as it greatly enriches their experience and may also benefit the local communities. The walks were really good, easy terrain but hilly and some longish days, some beautiful views. Wonderful to find infinity pool at hotel in Drouchia at the end of long hot walk. Self guided walks - need to use the gps maps to check on the right path. Also there wasn’t any notes on leaving bags at hotels, what to expect from taxi drivers etc - but no problem it all worked out and was well organised. Yes - it was wonderful to stay in smaller places and with local people. We are extremely happy that the travellers enjoyed their holiday. This is always our goal. As per the comments, we plan to make the process of luggage management clearer in the Roadbook. We would like to thank the travellers for allowing us to assist them in their exploration of Cyprus.